Winemaking is as old as civilization itself and wine has always been more than just a drink. For thousands of years, from its origins in ancient Mesopotamia to its current status as a vast global industry, the history of wine has been directly related to major social, cultural, religious and economic changes. 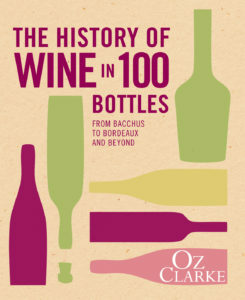 This fascinating and entertaining book takes a look at 100 bottles that mark a significant change in the evolution of wine and winemaking and captures the innovations and discoveries that have had the biggest impact on the history of ‘bottled poetry’. From goatskin to the German Ratskeller casks and invention of the glass wine bottle, from the short onion-shaped bottles of the 1720s to the tall cylindrical bottles of the 1780s, why Bordeaux, Burgundy and Hoch have their own distinctive bottle shape to the distinctive Paul Masson carafe of the 1970s. Other stories cover the first cork-topped bottles to screw caps, bag-in-box, cans and cartons, early wine labels once glue was strong enough, the first wine labels to be produced by a vineyard (and not a merchant as previously) and commissioned artwork by the 20th century’s most iconic artists for labels on high-end bottles; historically important and unique bottles: the oldest unopened, the most expensive sold at auction, the rarest; wines from the oldest vineyard in production, from the driest place on earth, from the highest and lowest vineyards and the most northern and southern. Oz Clarke also writes about the people who have influenced wine through the centuries, from the medieval Cistercian monks of Burgundy who first thought of place as an important aspect of wine’s identity, through scientists like Pasteur and Peynaud who improved key technical aspects of winemaking, to 20th-century giants like Robert Mondavi and Robert Parker Jr. Oz also talks about famous vintages, from the 1727 Rüdesheimer Apostelwein to the first Montana Marlborough Sauvignon Blanc in 1979 and today’s cult wines from Bordeaux and California. Click here for more information and to buy the book from Amazon.